"Working together" is at the heart of our new approach to collaborative procurement. What is the Shared Services Alliance (SSA)? 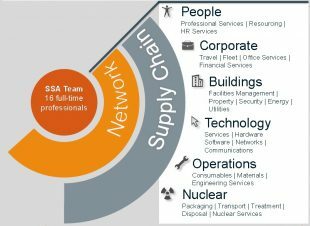 SSA is a procurement alliance made up of the Nuclear Decommissioning Authority (NDA), its subsidiaries and Site Licence Companies (Direct Rail Services, International Nuclear Services, Radioactive Waste Management, Dounreay, the Low Level Waste Repository, Magnox and Sellafield Ltd) as well as the National Nuclear Laboratory. As part of this collaborative procurement programme, we source any shared requirements across the NDA estate, such as facilities management, travel booking, IT services and radioactive waste management. The alliance members spend around £400 million each year through these collaborative contracts – that is over 20% of the NDA’s annual supply chain spend of £1.8 billion. We formed in 2010 to to identify how we could add value and save taxpayer money by purchasing the common goods and services we need together. This approach has already achieved savings of £286 million. What is next for the alliance? We want to build on this success by taking steps to enhance our cross-estate network. To do this we must implement a new delivery model. The new model will help sustain and grow savings. We want new collaborative sourcing strategies to achieve a further £175 million of cashable savings by 2020. A the same time, we will improve and simplify the way we procure. We want to reduce the cost and complexity of supplying to the estate to make us a more attractive client. How will the new ‘delivery model’ work? We are a full-time team of 16 people, who will lead the delivery of the Collaborative Procurement Programme. This team is a mix of existing people from within the estate and new recruits. We are also broadening the alliance’s remit to include leading improvement projects across the entire estate, such as integrating and standardising procurement processes or developing simplified terms and conditions. What difference do you hope the model will make? We were a voluntary network of people from across the estate, who often support the alliance on top of their day job. We could only ever take this arrangement so far. The biggest difference will come from having full-time specialist capability dedicated to shared services procurement. How will these changes benefit the supply chain? We want to change how we engage the supply chain. Thinking differently and embracing supplier innovations will help us identify new solutions to contribute to savings by changing the way our businesses buy and use shared services. With 9 alliance member companies, we have developed many different ways of doing things to achieve the same outcomes. Feedback from suppliers is often that we are too complex and difficult to supply to. We need to work together to be a more integrated client. For example, we will improve the pre-qualification questionnaires we ask suppliers to complete as part of the tendering process. By agreeing a single set of questions for all the essential elements we need to cover, such as safety management or financial health, we can publish a common question template through our existing estate wide online tendering tool. Suppliers will only need to answer these questions once to be able to use their answers in any tender responses across the estate. This reduces the burden and time spent by suppliers on tendering and makes it easier for smaller companies to participate in the process. It’s all about removing barriers so more suppliers can get involved and we can realise the benefits from new ideas. What do you think are the biggest challenges for the alliance? Our ultimate challenge is how to make savings for the NDA estate. We’ve done well so far by pooling our requirements and using our combined buying power. Now we have to go further and look for other opportunities from collaboration. We’ll need to challenge ourselves and look at how we shape, structure, simplify and standardise our requirements, ensuring the service levels we specify and the standards we set are proportionate to what we are buying. The alliance is made up of a diverse mix of businesses with different missions, lifecycles and sizes yet we do need many of the same goods and services to function. We must recognise our differences as well as our similarities and focus on areas where it makes sense to collaborate. It is about being pragmatic and not aiming for perfection. Even small improvements can make a significant difference to both us and the supply chain. This won’t be easy but by working together we can deliver value through collaboration. I'll be presenting at the #DecommSupply event on 3 November and will be happy to chat to any suppliers about SSA. Find us at Stand R3. Engica Technology System are currently implementing an asset maintenance & stock management system for Atos's client LLWR in Cumbria. I was wondering how we get involved in any decommissioning shared alliance events? Many thanks for your question. 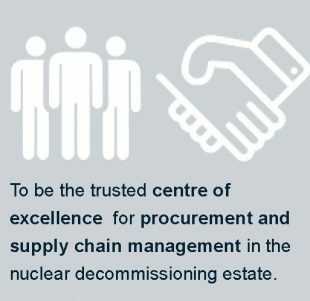 If you are interested in a specific collaborative procurement, then please refer to our procurement pipeline at the following website address: https://www.gov.uk/government/case-studies/shared-services-alliance-ssa-for-nuclear-decommissioning-estate for further information of upcoming activities. As part of the nuclear decommissioning estate, the Shared Services Alliance (SSA) participates in the annual NDA Supply Chain Event held each November, which provides an opportunity to engage with members of the SSA Team. Sign up for the NDA's e-bulletin, this is how the SSA will advertise any upcoming engagement opportunities. You might also want to join the NDA Estate Supply Chain Network on LinkedIn.